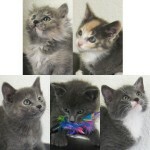 Ivan is a cuddly, handsome medium-haired grey juvenile boy, born 4/21/11. Ivan’s former owner decided to surrender him to the shelter because she is hardly ever home, and Ivan really craves human attention. He is a BIG kitty for his age, and everyone who sees him says he is one of the most attractive cats EVER. Ivan’s medium-length fur is very soft and silky, and would benefit from a 5-minute brushing every day or two. He has to be an indoor-only kitty because his front paws are declawed, leaving him no way to defend himself against dogs or other predators. Luckily, Ivan doesn’t seem to have any ill-effects from his declawing; he still uses his litterbox faithfully, and is a happy and loving boy. Silver is a a friendly, open girl whose owner could not care for her, so she is now waiting for you to invite her home. Silver’s estimated birth date is March 1, 2009, so she’s between 2-3 now. 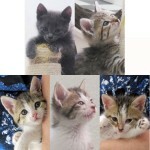 She has a lovely, medium length grey tabby coat and arresting golden eyes.